Whole Healing - Myotherapy & Therapeutic Sports Massage for Human, Equine and Canine in Kent. 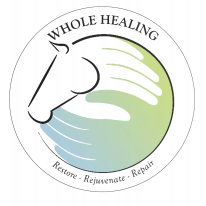 Whole Healing is run by Alexis Jackson, an ITEC Diploma Qualified Therapist offering fully insured, mobile Myotherapy & Therapeutic Sports Massage Therapy for Human, Equine and Canine throughout Kent and the South East. Alexis Jackson holds ITEC Level 3 in Therapeutic Sports Massage, an accredited Certificate of Equine Sports Massage and is also a full member of the Equine Sports Massage Association and is currently studying towards a Diploma in Galen Canine Myotherapy. Alexis has pursued a career in equestrianism for over 15 years, in the UK and abroad and has a thorough working knowledge and experience of many disciplines and through this has developed a keen interest in bio-mechanics and understands the importance of maintaining muscular efficiency in horses, dogs and people. Whole Healing was born from a passion to help you achieve your very best.
" Restore Rejuvenate Repair "